The Ministry of Health (MoH), in reviewing various strategies that will ensure a safe and adequate blood supply in Ghana, has indicated its intention to continue the expansion of the use of the Mirasol pathogen reduction technology and the haemovigilance programme. The technology which ensures protection against a broad number of pathogens, including HIV, hepatitis and malaria, has already been implemented in the Southern and Central Blood Centres to provide safer blood for patients both at the Korle-Bu and Okomfo Anokye Teaching Hospitals. “For the year 2018, we are committed to purchase $20,000 worth of disposables to sustain the programme and proceed to expand the programme in 2019 to include the Northern Zonal Blood Centres in Tamale,” Nana Kwabena Agyei, the Chief Director of MoH said. Representing Kwaku Agyeman-Manu, the sector minister, Mr. Agyei observed that a budget of between $300,000 and $400,000 per year would be allocated for the next five years to purchase equipment, disposables and provide maintenance for the installed equipment to support the sustainability of the programme. He was speaking at the handing-over of the Japan International Cooperation Agency (JICA) supported ‘Ghana Blood Safety Programme’ to the MoH for its sustainability after two years of implementation. Mr. Agyei explained that blood and its components have been recently added to the seventh edition of the Standard Treatment Guidelines and Essential Medicines List in Ghana as recommended by the WHO, and pledged the ministry’s commitment to championing the use of technologies for improving health services across the country, with limited risk of infections that could be transmitted through a blood transfusion. He furthermore admitted that the safety, availability and affordability of blood are key to effective healthcare delivery and the attainment of Universal Health Coverage (UHC) and appealed to the public to support voluntary blood donations to enable the NBSG to achieve 100 per cent voluntary unpaid donations by the end of 2020. Dr. Justina Kordai Ansah, the Chief Executive Officer of the National Blood Service Ghana (NBSG), indicated that the programme follows the licensing of the Mirasol Whole Blood (WB) system for use by the Ghana Food and Drug Authority in August 2016, after the African Investigation of the Mirasol System (AIMS) study was completed in Kumasi in 2014. The project was then adopted for sponsorship by JICA, in collaboration with the Terumo Corporation of Japan. Dr. Ansah said the programme had seen the significant training of a number of Ghanaian healthcare professionals in both Ghana and Japan for sustainability. Mr Koji Tomita, the Deputy Chief of Mission Counsellor at the Japan Embassy, and Mr Shin Kuroda, the Advisor of Terumo Corporation in Japan, thanked the collaborators for the success of the project and urged NBSG to ensure the proper maintenance of the equipment for safe, effective and efficient blood supply to Ghanaians. 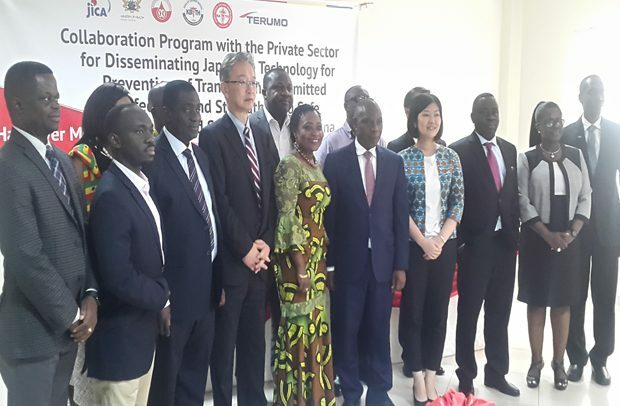 Ms Naki Ozawa, Senior Representative of JICA, pointed out that the project is not to merely introduce Japanese equipment to Ghana, but promote blood safety using well developed technology which had been scientifically proven to be effective.